Welcome to The Woodturning Store ! My name is Steve Fulgoni and as an engineer, "tool junkie" and hobbiest woodworker, I bought my first lathe in the 1980's. I scraped a few spindles and let the lathe sit for a few years. Becoming a dad in 1992 changed everything. With not much time for cabinetmaking anymore, I took another look at that lathe in the corner of the shop. That's when everything changed. I found woodturning to be a creative outlet where it was simple to get started, but takes a lifetime to master. I joined the local Long Island woodturning club where I found a community of artists, engineers, teachers and other individuals pursuing a passion of their own while at the same time helping others to develop theirs. The years have passed and woodturning is still my passion. As a member of the AAW (American Association of Woodturners) I have met wonderful people from all over the world. I am President of an AAW Chapters on Long Island and I hope to continue the tradition of fostering the art of woodturning. I love tools and have been developing them for 20 years. I teach and mentor woodturning locally. Most of the time I go in to my shop to de-stress and make chips after a day at work. The internet has made the world a smaller place. So now with the kids in college, I created woodturner.co to do my part in spreading the word about this wonderful art. My YouTube channel is "The Woodturning Shop". I hope you take a look. I hope to add more content each week. Part of fostering the art of woodturning means enabling turners to pursue their passion, not only with How-to tips and techniques but the the tools and materials they need to use. After years of making my own tools, I decided to offer tools for sale. On this website we hope to provide resources for both experienced and novice woodturners. 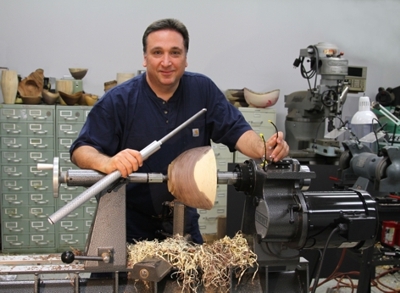 You will find woodturning videos, links to the American Association of Woodturners and how-to articles. We offer some of the finest woodturnng tools and accessories and we are adding to the website every day. I am happy to answer your questions and share ideas with you. Give me a call at (800) 884-9216 or (631) 421-TOOL (8665).